While some students were walking to class, five students wearing black surgical masks stood in silence on the Spine, holding posters and notes as part of the Q Center’s Day of Silence protest on Friday afternoon. When some students tried walking up to one of the five protesters, a small note was handed out. 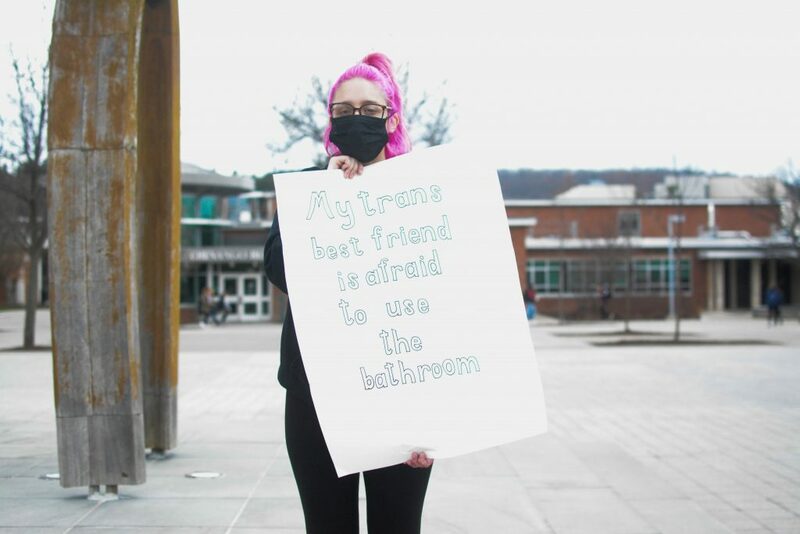 The Day of Silence, a movement where participants refuse to speak during the day to highlight the silencing of the LGBTQ community, is an annual protest at Binghamton University held by volunteers who stay silent to show solidarity with people who can’t openly discuss their LGBTQ identity. Luis Santiago, a programming intern at the Q Center and a junior majoring in biochemistry, organized this year’s protest and said it was meant to catch people off guard and make them think about the discrimination the community faces. However, Santiago also said the silence can sometimes lead to people ignoring the protest altogether. Demonstrators also moved the location of the protest in an effort to reach more students. Previously, the demonstration was held in the University Union or Glenn G. Bartle Library, but this year, it was held outdoors. The move comes after last year’s protest, when University tour guides avoided taking their tours through the Tillman Lobby after one guide messaged others in a GroupMe chat, suggesting they avoid the location because of the demonstration. Santiago said this was also a factor in his decision to move the demonstration outside — it would be in a place where nobody could avoid it. Throughout the protest, students passing by the Spine occasionally stopped to read the posters, asking questions and prompting protesters to hand them a note with an explanation about the Day of Silence. George Guerra, a freshman majoring in political science, said he came to the protest after class in an act of solidarity.